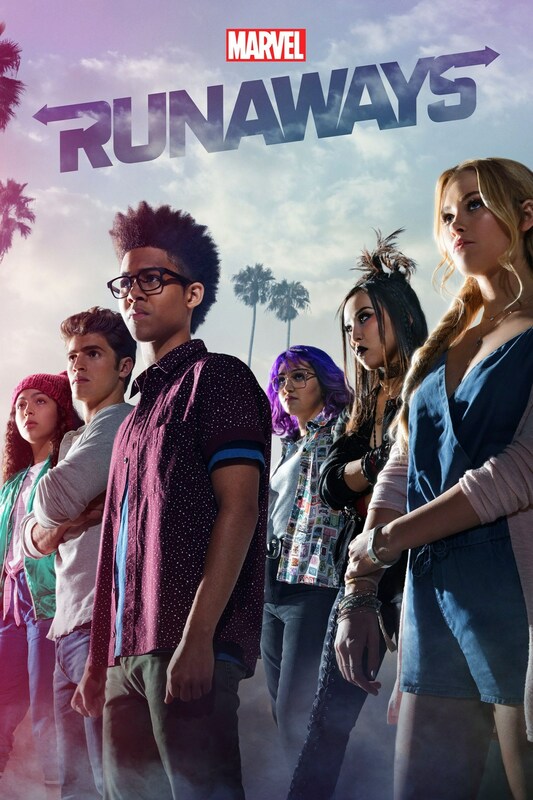 Marvel’s Runaways Season 1 – Review | Superhero etc. I read the original comic book a very long time ago, so while I remember the overarching plot there’s certain details that I’m struggling to remember. 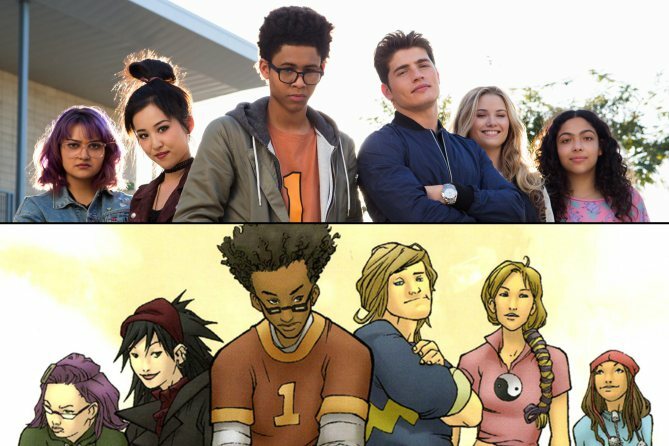 Runaways Season 1 is definitely much different than the original comic written by Brian K. Vaughan (who also wrote one of my favorite non-Marvel/DC comics Saga), but these changes are usually welcomed in my opinion. The most glaring difference is the actual plot to the story. Sure the premise is the same, but the actual plot is a drastic change from the source material. Bad change? Eh, not really. Granted, half way through the season I was getting nervous about where the show was heading but my worries were pretty much washed away with the season finale. So, what is the story? Well, a group of teenagers stumble upon their parents as they murder a young girl before their eyes. Shocked by what they have witnessed, they spend the majority of the season trying to learn exactly what their parents are doing and find some way to stop them. Along the way, different members of the group start discovering different things about themselves that may help them fight their parents along the way. Will the team find out the secrets of their parents? Will they be able to put an end to their evil deeds? And will they actually runaway??? Ok, so my biggest criticism of the entire season was that the team weren’t really running away. The show is called Runaways, and yet they hid from their parents more then they actually ran away from them. Now, I wouldn’t consider this a strong criticism any more since the season finale ended with them, well, running away. So in retrospect, the slow approach to them running away might’ve actually been an improvement since we’re able to get more depth out of their parents. The parents didn’t really have much of a character in the comics, but here they’re fleshed out a bit more here. In fact, they seem slightly less evil in this show then in the comic. They’re still in the wrong, but seeing all of them discuss with each other about what they’re doing don’t exactly make them out to be the most villainous team out there. With this in mind, I think that specific criticism of the show is ultimately lifted by the time the season ends. So with that, I don’t think I have any major criticisms that stuck out to me. Perhaps on multiple re-watches there might be flaws that start sticking out more, but as of now I can’t think of anything that really bugged me. The characters are well written, the pacing seemed fine to me, and the action….well, this really isn’t much of an action show. Perhaps that might be the only downside if you’re expecting another superhero show. So I should probably state that up front, this show is less focused on fights between the kids and their parents and more so just the struggles the kids have with dodging their parents. Sure, weapons and superpowers are present in the show, but they’re honestly used more often for tasks outside of huge fight scenes. Perhaps that will change in future seasons, but I doubt it. Personally, this didn’t bother me much. I honestly like superhero comics and stories more so for the characters than the action anyways. Sure, action is fun but I’m more in it for how the action effects character relationships more than anything. Which makes for a perfect transition into the characters. Let’s start with Karolina, because I have a lot to say about her. First of all, THANK YOU MARVEL FOR KEEPING HER GAY!!!! I was so nervous that they were gonna make Karolina straight like they’ve done with previous queer Marvel characters (*cough* Valkyrie *cough*) and they didn’t! Now, they hinted she was gay from the first episode so that made me hopeful, then I got happier and happier as the show progressed. Now, there’s more to this character than just being gay (thankfully), so let’s talk more about that. The interesting thing about the whole religious angle to her character is the fact that she was never religious in the comics and the Church of Gibborim is a show-exclusive thing. In fact, in the comics her bracelet is suppose to be a medical related device. Which I kind of think the religious angle makes more sense as a way to make her keep the bracelet on. You tell her that the bracelet is a medical thing, she might not think it’s a big deal to take it off temporarily. Tell her it’s for religious reasons and she’ll be more motivated to keep that thing on. They haven’t mentioned any alien origins to her powers, but I hope they keep that. I was also wondering if her being gay would come into conflict with her religion at all but that didn’t seem to be the case. Would be interesting commentary! Tangent: I always pronounced her name in my head as “care-oh-line-a” not “care-oh-lee-nah”. So every time they pronounced her name, I got a little frustrated. Did anyone else thought her name was pronounced differently? Nico was my favorite character from the comics and she’s done well here too. Although I think the main reason I liked her is because she’s goth and I like goths in fiction. The makeup she wore in the series was a fun part of her character that I enjoyed. The magical aspect was also pretty cool, but they made slight changes to her from the comic. In the comic, her body absorbed the wand and she could only summon the wand by bleeding. This was often in the form of self harming, so they decided to ditch the self harming aspect as so kids don’t copy the show. So once the season ended, I’m pretty sure her mom still has the wand. Which makes me wonder what she’s going to do without it. Also, is Nico a lesbian in this? 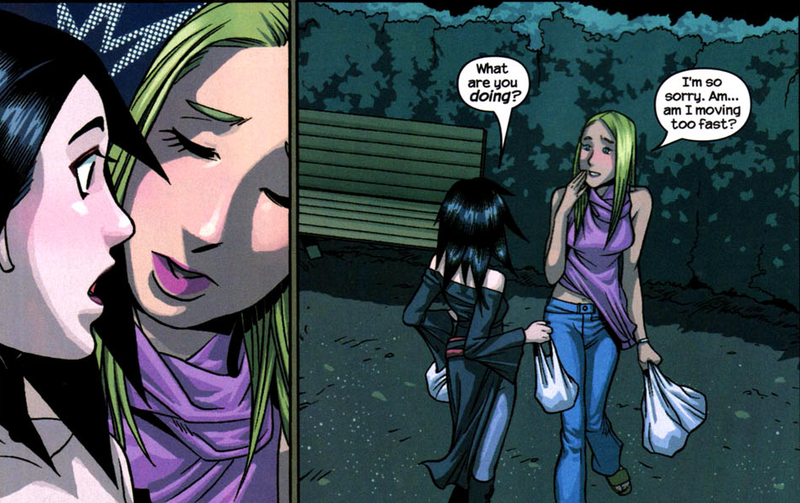 In the original comic, there was a scene where Karolina tried to kiss Nico and Nico rejected it because she was straight. The first time Karolina kissed Nico, I thought they were basically doing that scene only having the two actually kiss. But in the last episode, Nico went to kiss Karolina. So, are they lesbians together? I’m actually pretty fine with that. Now let’s just wait for all the shippers out there to obsess over this show. What will the ship name be? KaroNico? NicoLina? Gert was probably my least favorite character, but I surprisingly didn’t hate her. I actually don’t remember her being so SJWey in the comics, but in the show she would randomly have these mini feminist rants and it just kind of annoyed me. Not terribly, since she didn’t beat the audience over the head with her feminism, but I just kind of rolled my eyes whenever she went on them. Although I should mention that I’m not against feminist characters in TV shows, but she did annoy me. The only thing I really liked about her was the fact that she had a pet dinosaur. Said dinosaur looked fake as hell, but it’s a low budget TV show so what do you expect? Molly is Gert’s younger step-sister. In the comics, she’s a mutant with super strength. Here, she has super strength but got her powers from an explosion or something. Kind of confusing actually. After Disney bought Fox, I was hoping they just wouldn’t give her powers an origin in season 1 so they could call her a mutant in season 2. Very minor detail, but it would’ve been nice. She’s cute and I liked her. Chase doesn’t have any powers but he does have these metal gloves he wears that shoots energy blasts. Not as cartoonishly big as the comics, but this is a live action show so I guess that wasn’t going to happen. I don’t remember Chase being a jock in the comics. I don’t know if that was an actual thing that I just forgot or if the TV show totally changed that aspect of his character. The last character is Alex, and I saved him for last for a good reason. If you’ve read the comic or is at least familiar with this character, you probably have no fear in reading this bit. However, there are aspects from the comics that may be considered major spoilers for season 2. So, if you don’t want possible Season 2 spoilers, don’t read anything that I have italicized as that will mark said spoilers. Ready? Ok. So, the first story line of the Runaway’s comic concluded with a reveal that Alex was actually working with the evil parents the whole time and was a traitor to the team. There’s been very minor hints that Alex may not be who he claims he is, but nothing confirmed. So I suspect that he might end up turning on the team at some point. Even if he’s not actually a traitor yet, perhaps in later seasons the Pride will get in contact with him somehow and convince him to turn on the team. He may give out their location or some form of sabotage. The season finale really got me excited for the next season, so a little discussion on what may be to come? The second season will be the season that actually starts the running away part of the “Runaways”. I hope this doesn’t become cliched, but that’s what I’m getting nervous about. Since they’re also wanted criminals now (cept Molly, whose been “kidnapped”) this will add some level of suspense since everybody they encounter might call the police or try to save Molly from them. Overall, I give the show a solid 9/10. It’s a great show with great characters and a suspenseful season finale. I can’t wait til Season 2 comes out and I’ll be watching every episode the second it comes out.